Be the first to share your favorite memory, photo or story of Margery. This memorial page is dedicated for family, friends and future generations to celebrate the life of their loved one. 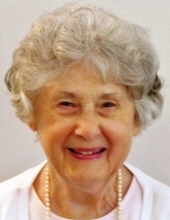 Margery died December 29, 2018 in Parkwest Medical Center, Knoxville, Tennessee at the age of 94, after a brief illness. Marge was born in Wayne, Pennsylvania on June 17, 1924, to Fred and Helen (Wolfe) Harley. She lived in Radnor, PA until she was 21 years old, when she moved to Philadelphia and worked for the Pennsylvania Railroad. She met the love of her life, Bart Spear, while performing in a skit at the YMCA there. They married on November 8, 1947 in Philadelphia, and then moved to Erie, PA where Bart and Marge together ran Spear Photography until Bart's death in 2001. In 2005, Marge then decided to move to Knoxville, Tennessee, to be closer to family members. She spent the next 13 years enjoying her own apartment, her beloved family, taking long walks and visiting the library. Marge was well-noted for her love of all creatures-be they plant or animal-and her love of reading. She was particularly fond of the beavers and loons at Forked Lake, NY, where her family vacationed for a week each summer when her children were young. She never saw a bird or a flower that she couldn't see God's handiwork in. Marge was always grateful for family and friends and wrote many notes of appreciation and gratitude for kindnesses shown to her. Marge loved being out-of-doors and observing nature. Walking was a big part of her life and she often stopped along her walks to admire the beauty around her. She knew many birds by sight or by sound and would often point them out to her walking companions. She moved to Elmcroft Assisted Living in early 2018. Marge was predeceased by her husband, Bart, her parents, her brother, Fred Harley and his wife Peg, and her brother-in-law, John Spear. Marge is survived by daughter, Barbara Emery and special friend, Mike Ray, of Knoxville, TN; son, Thomas Spear and wife, Judy, of Nashville, TN; and daughter, Nancy Spear and husband, Mike Madigan, of Murphysboro, IL; surviving, grandchildren include Megan Emery Osler and husband, Dave; Sam Emery and wife, Nicola; Max Emery, Eric Spear, Joni Spear and husband, Michael Boucher, and Chris Spear and husband, Arthur Kirkby; great grandchildren include Annika, Svea, and Linus Osler, and Willa Jean Emery. Marge adored her grandchildren and great grandchildren and she considered faith, family, and friends her major purpose in life. The family will receive friends from 12 Noon to 1 p.m on Saturday, January 19th at Farragut Presbyterian Church, 209 Jamestowne Blvd, Farragut, with a Celebration to follow at 1 p.m. with Rev. Matthew Nieman officiating. Marge lived life well, and above all, loved her walk with God. To send flowers or a remembrance gift to the family of Margery Jean Harley Spear, please visit our Tribute Store. "Email Address" would like to share the life celebration of Margery Jean Harley Spear. Click on the "link" to go to share a favorite memory or leave a condolence message for the family.